For one man in Florida is was a regular day. He was in his driveway unloading groceries from his car when two men attacked. 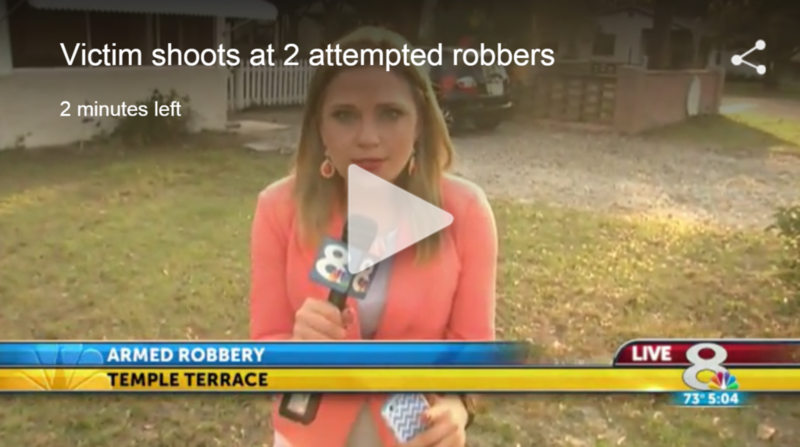 According to WFLA, one man grabbed him while the other suspect drew his firearm and pointed it at the victim. He was able to wrestle himself loose enough to reach for and retrieve his own firearm. He didn't hit the suspects, which makes me wonder a little about how much he trained, but it was enough to deter them and send them running. It’s a dangerous situation, we don’t urge anyone to get into a firefight with criminals and especially don’t try and grab a firearm. Don’t be James Bond. This victim is very fortunate that he was not more seriously injured,” said Michael Dunn, a spokesman for the city of Temple Terrace. I suspect Mr Dunn would have preferred if the citizen had just stood there quietly while the suspects shot him. I think Mr. Dunn is a dammed fool ! with a firearm in your close range.??? really now, you were not in his shoes. We don’t know the threat level understood by the victim. If I understood from the perps’ words or actions that they posed a high risk of serious bodily injury to me or others then I definitely would have fought back. If the perps gave me the impression they were hesitant and their hearts weren’t in the attack and no one else was at risk of harm (i.e., family in the yard / house / coming home anytime soon) then I MIGHT have cooperated and reported it afterward. From a threat response standpoint I lean toward fighting back.